The first known grower of cranberries in the United States was Henry Hall. Hall began cranberry-producing cranberries in 1816. Approximately 50 years later, in 1860, Edward Sacket, traveling from the east, arrived in Berlin, Wisconsin and began cultivating the cranberry marsh he discovered on his land. Others in the area followed Sacket's successful endeavor and for nearly 20 years, the area experienced increased economic vitality. However, in the early 1880's, the weather-rain and floods in 1881, and a heavy September frost in 1882 greatly diminished the cranberry industry in Berlin. 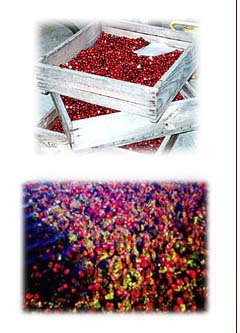 At its highest point in 1874, cranberry production reached 30,000 barrels. In 1883, production had dwindled to 3,000 barrels. During the Berlin boom, cranberry growing was beginning in other parts of the state, specifically in the Wisconsin Valley, including Jackson, Juneau, Monroe, and Wood counties. Several of the marshes begun in the late 1800's are still in operation. 4th and 5th generation growers, cultivating the same marshes as their great-great-great grandparents had done. Currently in Wisconsin, there are about 200 cranberry marshes in 18 counties. Cranberries are the number one fruit crop of the state and Wisconsin produces more cranberries than any other state in the country. In fact in the last harvest nation wide, Wisconsin produced 58 % of all the production in the united States. More cranberries were produced in Wisconsin than all other areas of the country combined. Just this year the Wisconsin legislature made the Cranberry the Wisconsin State fruit.